Jim Duguay and Katie Eleam pilot a drone over runway 27R at Hartsfield-Jackson Atlanta International Airport. One by one, jetliners fired up their engines and roared down runway 27R at Hartsfield-Jackson International Airport in Atlanta. It was just before noon on a sunny Friday morning, and air traffic controllers were in a hurry to get the planes airborne before the runway closed to all traffic. Half an hour later, the whir of propellers sent a small, white drone into the heat haze above the concrete. It hovered in the air then zipped back and forth across the runway snapping pictures. 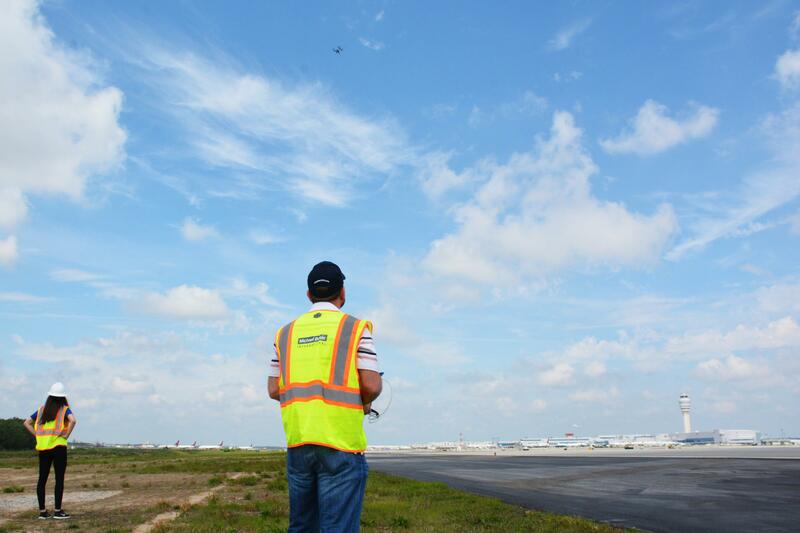 So began the second unmanned aircraft flight in a month in the airspace at Hartsfield-Jackson. Federal regulations now allow the aerial vehicles in the airspace around the country’s busiest airports. “You’re drifting to the right a bit!” said Katie Eleam, tracing the path of the drone with her eyes as she acted as a spotter for her co-worker flying the small aircraft. Eleam works for Michael Baker, the contractor using drones to inspect runway conditions at Hartsfield-Jackson. Katie Eleam acts as a spotter for pilot Jim Duguay, who has to fly the drone manually in the busy airspace around Hartsfield-Jackson. Michael Baker uses a drone from Chinese manufacturer DJI. You can buy one for just a few thousand dollars, but don’t expect to use it at your nearby international airport. Eleam’s team got that lock disabled for this project, but still can’t use autopilot or any pre-programmed flight plans. That means Jim Duguay has to fly the drone manually. Normally, this work happens on foot. Teams armed with cameras walk up and down the runway taking pictures to assess wear and tear. Chaim VanProoyen, a project manager at Hartsfield-Jackson, said that can take up to five hours. Using a drone could cut that time in half. Runway 27R is the longest one at the airport, and large international flights need it to take off and land. VanProoyen said reducing runway downtime means fewer impacts for passengers and helps Hartsfield-Jackson keep its hard-fought title as the world’s busiest airport. Drones also give his team better data, which they’ll use in their multi-year runway maintenance project. “This will allow us to 3-D map the runway and be able to see detailed cracks and be able to plan better for basically replacing the runways,” VanProoyen said. 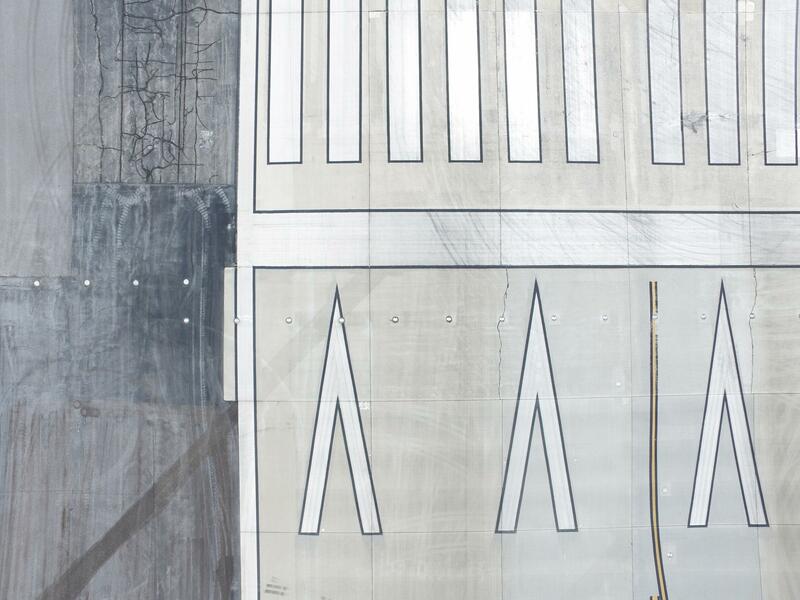 A photo of runway 27R captured by drone. It's one of many engineers at Atlanta's airport will use as they plan repairs to the runway, which is crucial to Hartsfield-Jackson's operations. Unmanned aircraft are pretty new around airports like Hartsfield-Jackson. The Federal Aviation Administration codified its rules for commercial drones last year and only started allowing them in class B airspace, which surrounds the country’s busiest airports, a few months ago. Jim Williams works with unmanned aircraft for the consulting firm Dentons. He said the runway survey flights in Atlanta are the first time a commercial drone has flown at a major U.S. airport during normal operations. Still, Williams acknowledged passengers might be wary of the technology. Inside Hartsfield-Jackson’s south terminal, a number of fliers said they weren’t totally comfortable with unmanned aircraft at the airport. Gail Walton said she’d be pretty concerned if she looked out her airplane window and saw a drone on a nearby runway. “I would probably wonder what it was doing out there: probably ring my call bell and ask one of the flight attendants what it was,” she said. It’s a question flight crews will likely hear more and more in the future. The FAA has already approved more than 500 commercial drone operations in the airspace around the country’s busiest airports. Hartsfield-Jackson Atlanta International Airport, the world’s busiest, is getting a $6 billion facelift. The details were outlined by airport General Manager Miguel Southwell on Thursday. The announcements came as part of the inaugural State of the Airport address at the Georgia World Congress Center. Southwell said the project will not only "be transformational for the airport, but they will enable the needed expansion to accommodate the growing demand we have at Hartsfield-Jackson."